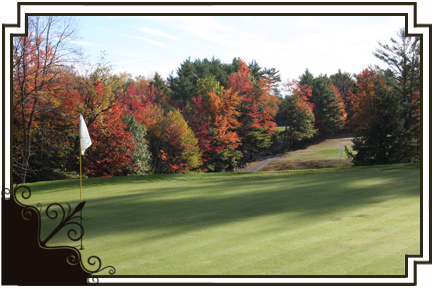 Make Winchendon your golf destination in the Monadnock Region! Winchendon is a short, narrow course with small, undulating greens and hilly fairways that are basically untouched from the day Ross redesigned them in 1926. Some bunkers and tees have been modified over time but the basic layout remains intact. The course requires an accurate short game, and local knowledge will help the golfer overcome the often tricky lie. The golf course features bent / poa greens and narrow native grass fairways and rough. There are no homes bordering the fairways, allowing for magnificent views of the surrounding mountains and extensive woodlands. A striking view of the New England landscape from the 3rd and 7Th tees, with Mt. Monadnock in the distance, will rival any in the area. Playing this course in the autumn is especially picturesque with vivid reds, yellows and gold surrounding the golfer in a serene, natural atmosphere. Here is a course where Ross maximized the topography, keeping all its very best features. As little earth as possible was moved, and like many Ross courses, it looks far easier than it is. Ross lovers will love Winchendon very much, indeed.